Rare inscription noting Jerusalem found in archaeological digs near Binyanei Ha'uma in the capital. An exciting archaeological discovery uncovered in Jerusalem was presented for the first time Tuesday at a press conference of the Israel Antiquities Authority (IAA) and the Israel Museum. 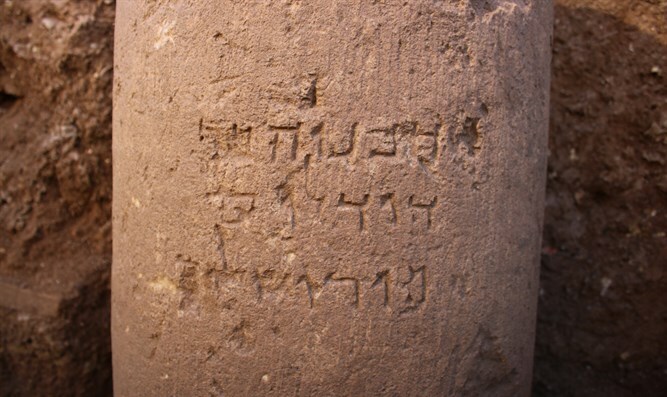 It is a stone inscription from the Second Temple period (1st century BCE), which marks Jerusalem's name in Hebrew letters in full spelling - as is written today. The inscription was discovered last winter near Binyanei Ha’uma in the capital, in an excavation conducted by IAA archaeologist Danit Levy before the paving of a new road. During the excavation foundations of a building from the Roman period that was supported by column sections were exposed. The crowning glory was a round stone column that was incorporated into the Roman building repeatedly with an Aramaic inscription in Hebrew letters, typical of the Second Temple period, around the reign of Herod.